Check out this article from HubSpot about brands that nailed their customer care on Twitter! Click here to learn more about specific ways you can give your followers some love. 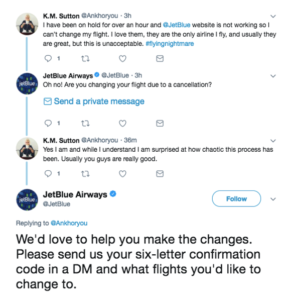 Check out this article from HubSpot about brands that nailed their customer care on Twitter and their example from JetBlue. Click here to learn more about specific ways you can give your followers some love. When asking about our clients’ least favorite social media tool, Twitter is often at the top of the list. We understand some of the frustration, but with 330 million monthly active users, Twitter is not going anywhere anytime soon. So, before you throw in the towel on tweeting, try these top twitter tactics for tourism marketers! Upload video – use the video that you share everywhere else on Twitter too! Embed Tweets in landing pages to extend the story + build awareness. For more details on how to improve your Twitter game, visit our blog! For more on why these metrics are important for your destination, read the full blog. For more tips on how to market your next major event, read our entire blog post. Influencer marketing has taken the social media world by storm in the past few years. If you are thinking about running an influencer marketing campaign in your destination, check out our list of ways to run a powerful influencer marketing campaign. Click here to learn more about how you can maximize your influencer’s visit and how to track your success after they’ve left. Determine the story you are going to tell and why – it’s important to have an idea in mind before you start creating your story. Post-story distribution: stories are only live for 24 hours, but make sure that you fully leverage the content that you spent time creating! For example: Add to a highlight, upload to Facebook and YouTube. For more details on how Instagram stories developed in 2018, read the full blog post. Email marketing can be a tricky thing to master, especially in a world that seems to be dominated by social media. However, this definitely doesn’t mean you should give up on your email marketing strategy! Your email marketing program gives visitors the necessary information they need before visiting your destination. It’s also a great way to encourage past visitors to come back. Click here for the causes and solutions to these challenges to help improve your next email marketing campaign. What is the most important thing that you learned about destination marketing in 2018? We’d love to know! Comment on the Facebook post or send us a direct message on Facebook, Instagram or Twitter. Or, if you like going old school, just shoot us an email at info@twosixdigital.com.